If you have desired to live in an open and beautifully scenic area, Bell Canyon is the place for you! Just a few miles from the 101 Freeway and the 118 Freeway, this area offers the lifestyle of privacy and seclusion, yet offers easy access to schools, shopping, hospitals, and much more. Bell Canyon is a horse community that sits at an elevation of 1,368 feet with breathtaking views. In 1967, a partnership was formed to purchase the geographic area to develop the future community of Bell Canyon. In 1968, the Bell Canyon Equestrian Center was built and began operation. In 1969, a new subdivision called “Woodland Hills Country Estates” was developed and opened for sales. It was a success, selling almost all of the 800 homes lots within less than two weeks. Later that year the residents of the community took leadership and renamed the community “Bell Canyon”. 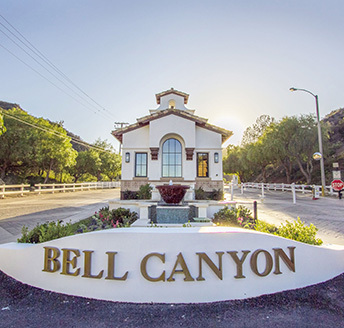 Today, the private guard-gated Bell Canyon has developed into a thriving community, made up of 800 custom estate homes including many equestrian properties with stables, turnouts, and other horse facilities on their site. At the heart of the horse community sits the Class-A equestrian center. The grounds, which can accommodate up to 120 horses, features four barns with 80 stalls, corrals, sand riding arenas, enclosed bullpens and hot walker, and a few shaded picnic areas. The organized community events included the annual “Hot August Night”, which is a community fair with pie-eating contests and chili cook-offs, “Snow Day”, “Movies in the Park”, and much more! Bell Canyon is the perfect family community!